The professionals at P4 Security Solutions have extensive backgrounds in the field of armed security services. Drawing from our experience in private/corporate security, law enforcement and military service, we have a unique perspective which allows us to conduct the finest Firearms Training program in the industry. Our comprehensive Firearms Training course is designed to give security industry professionals the skills and knowledge they need to effectively and properly utilize their firearms in every day operations. The Firearms Training program provided by P4 Security Solutions covers the following aspects of firearm management. Industry professionals today face unprecedented challenges and tactical firearms training plays a crucial role in equipping your personnel to engage in successful and effective security practices. 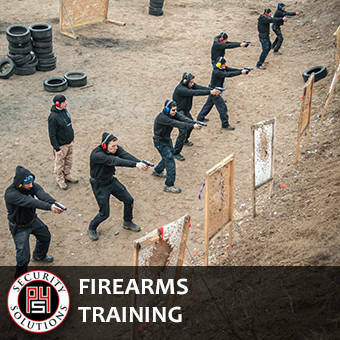 Contact us today to learn more about our Firearms Training course and how P4 Security Solutions can put our decades of industry knowledge and experience to work for you.